은 조선시대 헌종의 어머니인 조대비(1808∼1890)의 40세 생신을 축하하는 잔치모습을 그린 병풍이다. 조대비는 순조 19년(1819) 세자빈으로 책봉되었으나 세자가 왕위에 오르지 못하고 일찍 죽어 왕비는 되지 못하고, 후에 그의 아들인 헌종이 왕위에 오르자 후에 왕대비가 되었다. 가로 458㎝, 세로 169㎝의 8폭으로 된 병풍으로 7폭은 전각, 나무, 산수를 채색하여 그렸고 마지막 1폭은 도총관 조기영 등 9명의 관등과 이름이 기록되어 있다. 헌종 13년(1847) 정월 초하루 창덕궁 인정전 앞뜰에서 거행된 잔치에는 400여명이 참석했는데, 관직에 따라 서로 다른 관복을 입은 문무백관과 행사에 참여하는 인물 그리고 창검을 들고 도열해 있는 군관들의 모습을 사실적으로 표현해 당시 궁중의식의 한 단면을 엿볼 수 있다. 화려한 색깔의 진채를 사용하여 그린 전각, 나무, 산수 등과 인물들의 섬세한 표현에서 도화서의 일류급 화원들이 그린 작품으로 추정된다. 이 작품은 회화사에서뿐만 아니라 당시 복식연구와 130년 전의 궁중풍속을 볼 수 있는 기록화로 귀중한 자료가 되고 있다. 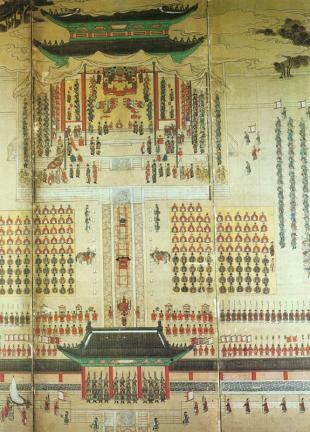 This folding screen depicts scenes from the 40th birthday celebration of Queen Dowager Jo (1808-1890), the mother of King Heonjong of the Joseon Dynasty. She was invested as the crown princess in 1819 (the 19th year of the reign of King Sunjo), but as the crown prince died before ever becoming king, she became the queen dowager upon her son’s (King Heonjong) ascension to the throne. This eight-panel screen measures 485 cm in width by 169 cm in length. 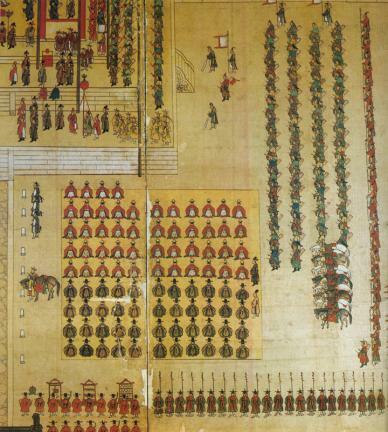 The first seven panels contain color paintings of the royal palace, trees, and landscape, while the last (eighth) panel contains the titles and names of nine officials, such as Dochonggwan (a title) Jo Gi-yeong. The queen dowager’s 40th birthday party was held on the first of January 1847 (the 13th year of the reign of King Heonjong) in the garden of Injeongjeon Hall at Changdeokgung Palace. The painting depicts some 400 civil and military officials who participated in the party, each of them wearing a distinct official uniform according to their rank and title. The military officials are also shown standing in a line with spears and swords in their hands. As all of the scenes are depicted realistically, it is assumed that first-rate painters of the Dohwaseo (a government office in charge of paintings) produced this picture as they used splendid colors and delicate brushwork to portray the palace, trees, and landscape. It is regarded as a very valuable artwork for studies not only on the history of painting but also on the history of clothing styles and Royal Court customs and manners of the period.